The standard Nintendo Labo kits include designs like robot arms, mini pianos, and fishing rods, but some players have been able to use the raw materials to create other stuff, like this steering wheel for a motorized wheelchair. Over the weekend, Nintendo encouraged people to get even more creative with a contest for the most wild and ambitious creations. Yesterday, the company announced the winners. The contest had a bunch of different competition categories, each emphasizing different criteria, like aesthetics or functionality. 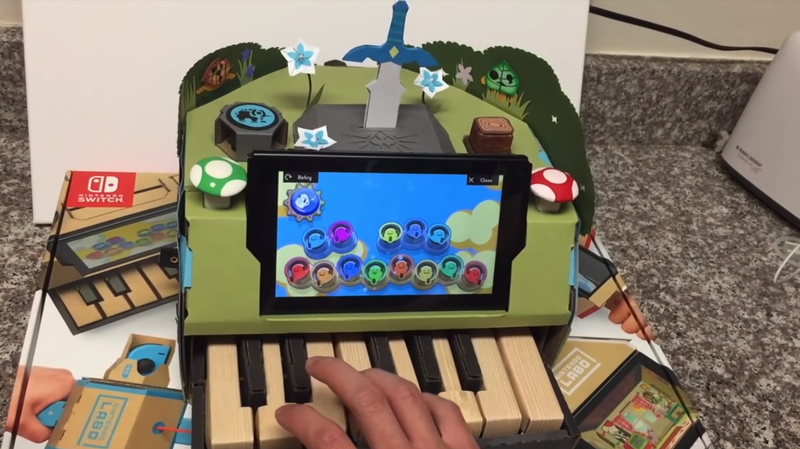 The Best Decorated Toy-Con category, which awarded its honor to the best design involving the joy-cons, fell to a Legend of Zelda-themed piano, a treehouse, and a hand-painted T-Rex. The piano, made out of paper and clay, is perhaps the most impressive of the three. Its keys play ocarina sounds, and it also comes complete with a Master Sword that doubles as an IR sticker. When the sword gets pulled out of the stone base at the top of the Toy-Con, a special animation plays on the screen. There were two other categories, Best Toy-Con Mod and Best Original Invention. Winners’ projects ran the gamut from an analog alarm clock to a tea time mini-game built around cardboard teapots. The teapots fill with imaginary tea as soon as the lids are opened, and they get emptied by pouring, with the Switch tablet tracking how much tea is in each one and how many customers are waiting on their serving. It looks like Tapper, the ’80s arcade game that involves serving customers beers in a timely manner, but with real life props. There’s even a co-op mode in which players manage teapots placed at multiple tables. The standout for me is the solar-powered cardboard accordion, which won the [xyz award]. The bulk of the design is two tissue boxes, which are connected by a series of folded pieces of paper. One of the boxes houses the Switch, and the other has a series of cut-out holes for each musical note. The right Joy-Con is situated inside the second box, where its sensor can pick up a finger blocking sunlight from entering one of the holes, at which point the accordion produces the corresponding sound. Meanwhile, the left Joy-Con is in the second box, tracking rotation and distance so the musical notes can be extended and augmented, just like an analog accordion. Like the best Labo creations, the design uses super-cheap materials assembled in a simple way to create something more impressive than the sum of its parts. In addition to a shout out from Nintendo, each winner also got the special edition Labo-themed Switch the company revealed for the contest last month.